Seashell Cottage01263 715779work01603 870304fax Self-cateringThis delightful brick and flint seaside house is stylish but comfortable and very spacious, with plenty of living space, two bedrooms and two bathrooms. So close to the sea and local amenities yet hidden away in a quiet, almost secret location. Sheringham is a very popular coastal resort with excellent amenities and travel links. Other: Towels, Books and Games. Stairgate, high chair, travel cot (Travel cot, highchair and stairgate not available 2019). Seashell Cottage offers weekly bookings starting on Friday. This delightful brick and flint seaside house is stylish but comfortable and very spacious, with plenty of living space, two bedrooms and two bathrooms. So close to the sea and local amenities yet hidden away in a quiet, almost secret location. 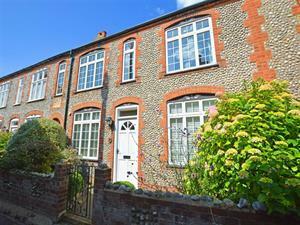 Sheringham is a very popular coastal resort with excellent amenities and travel links.